Privacy is important, even more so in the outdoors. If you agree with it, you are definitely fond of this homelike tent. This portable, double-sized pop-up tent offers a convenient shelter for showering, changing, and answering the call of nature without compromising comfort & privacy. With a waterproof covering that also protects from excessive UV rays, this tent will become an essential camping companion in no time. It's lightweight, durable and easy to set up, with a handy carrying case included. 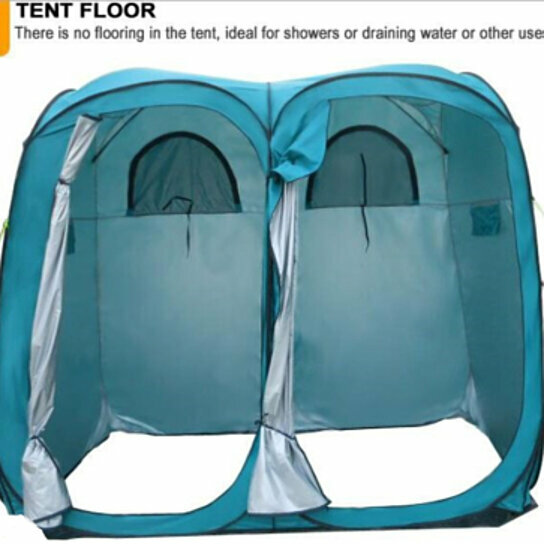 For your extended stays in the great outdoors, or for those muddier days, this shower tent is ideal! With a shower hook & extra ventilation, you & the family can clean up, tidy up and spruce up all while roughing it. The ensuite tent also acts as a great portable changing tent. It is free standing but comes equipped with extra guy line pegs and peg down points for those windy camping days when things get carried away.